Intel promised super fast and high-capacity SSDs with 3D NAND chips last year, and the company announces the first of those drives Thursday. The new SSDs stand out for blistering speed, but top out at 2TB of capacity, which may be a disappointment to some customers considering the drives could potentially hold up to 10TB. The new lineup of SSDs with 3D chips includes the SSD DC P3320, SSD DC 3520, SSD DC D3700 and D3600. The SSDs are targeted at data centers, workstations and storage arrays. Intel remains far behind rival Samsung, which earlier this month announced the PM1633a SSD, which has 15.36TB of storage. The Samsung drive also uses 3D NAND chips. The Intel SSDs were built more for speed, durability and reliability, which is a priority for enterprises, Intel said. Intel uses 3D NAND flash from Micron, which started shipping the chips last month. The 3D NAND flash has more density because storage cells are layered on top of each other, an improvement from current SSDs in which flash chips are placed next to each other. The storage chips are also closer, making SSDs faster. The SSDs also plug into PCI-Express 3.0 slots, which are faster than conventional SATA slots. The PCIe storage protocol is formally called NVMe (Non-Volatile Memory Express). 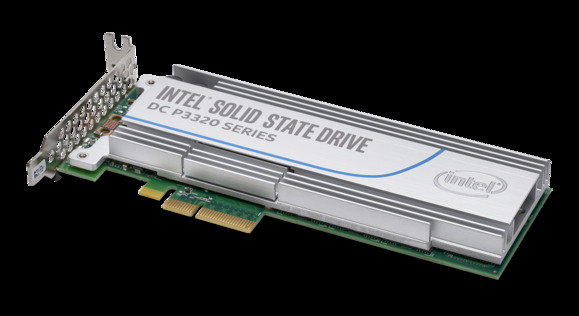 Intel estimates its SSD DC P3320 is significantly faster than conventional SATA SSDs. The SSD will come with up to 2TB capacity. The SSD has a random read speed of 365,000 input-output per second, which is five times faster than the company's older SSD DC S3510. The random write speed is 22,000 IOPS, which is 1.4 times faster. The sequential read speed is up to 1600 megabytes per second, 3.2 times faster, and the write speed is 1,400 megabytes per second, which is 3.1 times faster. The price for the SSDDC P3320 wasn't immediately available, and it will ship in the second quarter. The other SSDs include SSD DC D3700 and D3600, which can take advantage of two PCI-Express ports to boost SSD speeds. That's similar dual-port SAS (serial-attached SCSI) ports in storage devices. Those SSDs have random read speeds of up to 470K IOPS, which is 3.9 times faster than comparable dual-SAS drives, and random write speeds of 95,000 IOPS. The sequential read speed is 2,100 megabytes per second, which is 1.8 times faster, and write is 1,500 megabytes per second, which is two times faster. Intel also introduced the SSD 540s drives for thin and light laptops. Drives with up to 1TB capacity will be available in the 2.5-inch and the smaller m.2 form factors. Intel didn't provide prices or shipment dates.